is it important to have super user for ACW? Ricochet & Onionshare has an Onion grater issue in “Extend onion-grater Whitelist” instruction step mentioned in the wiki. (on gateway only) would be a separate discussion. yeah thats why better to disable them by default. OnionShare tested and its working! changed 4 files with 85 additions and 4 deletions. changed 2 files with 3 additions and 2 deletions. Fix in all buster repositories. Actual ricochet connectivity test has not been done by me. Would be nice if you could test. Add Workspace Switcher by default because if you open TBB and then open file manager and then press/hold the file manager top bar and go left of the screen then TBB page will disappear. it didnt disappear actually but the file manager window went to a new workspace. and in order to see all the work spaces you need to add workspace switcher plugin to the taskbar by default. then move the workspace switcher near to the browser icon (left) for better control. Make PulseAudio Plugin visible by adding it to the taskbar/Panel in WS. 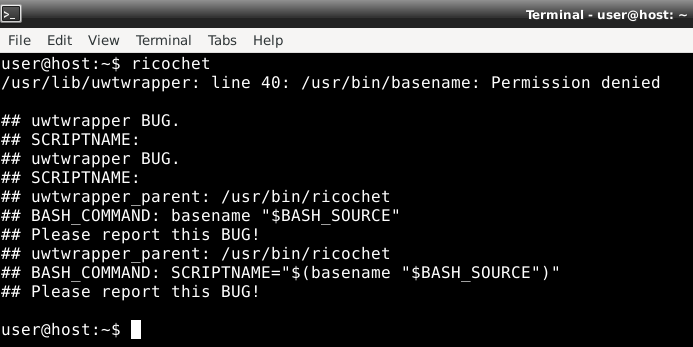 Ricochet giving false claims that its working but its not. CoyIM tested and working here fine. Accounts can be created staright away and I’m logged into them as online.